Shovels were put to dirt Wednesday at the future location of a Comfort Inn in Greater Napanee. From left to right is: Lilly Hoshowsky, construction manager with Chamberlain Services Limited, Shahid Mahmood, president of the Waraich Development Group, Bill Lowry, Warden of Lennox and Addington County, Mushtaq Ahmad Waraich, Marg Isbester, Greater Napanee deputy mayor and Gord Schermerhorn, Greater Napanee mayor. Photo by Adam Prudhomme. 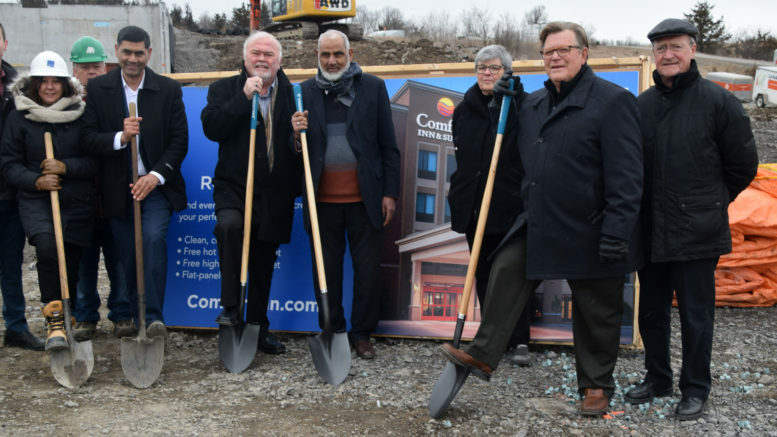 Ceremonial shovels hit the ground Wednesday as Choice Hotels Canada officially announced plans to construct a 66-room Comfort Inn and Suites at 31 Community Road in Greater Napanee. The hotel is expected to open towards the end of this year. It will mark Choice Hotels’ first foray into Napanee, though they did break into the Kingston market two years ago. Napanee’s construction is one of three currently underway for the company, which is also expanding into Bowmanville and Goderich. Staffing for the new hotel is expected to take place throughout the construction process as training will take place offsite in preparation for the grand opening. Local franchiser Shahid Mahmood, president of the Waraich Development Group, said he spoke with both Lennox and Addington County and Greater Napanee representatives when researching a potential location. Greater Napanee’s booming sports tourism industry was a big draw. Often times when major provincial or international tournaments have come to town, teams have had to book accommodations outside L&A County due to a lack of space. Members of Greater Napanee’s town council as well as L&A County council were on hand for the ceremony. Along with 66 rooms, the hotel is expected to include an indoor pool and fitness centre. It will become the 151st Comfort Inn established in Canada.